The Historical Society of Palm Beach County pays homage to Addison Mizner in this remarkable exhibition by guest curator, Augustus Mayhew. Visitors can pour over artifacts from private collectors and treasures from the Historical Society of Palm Beach County’s collection to understand the changes that Mizner brought into this part of Florida, both architecturally and with his innovative business models. 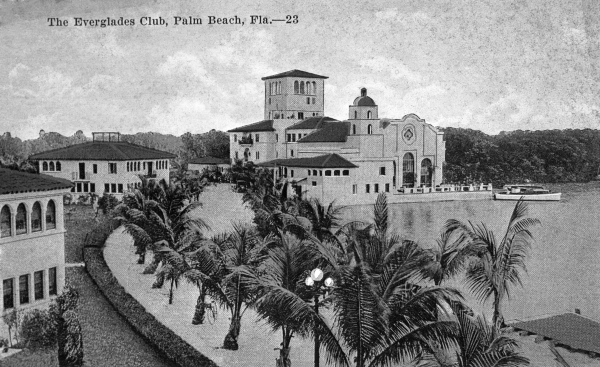 Mizner’s story is illustrated with selected items from the Historical Society’s extensive permanent collection, and includes photographs, architectural plans, sketches, scrapbooks, and diaries, as well as decorative objects and furnishings produced by Mizner Industries, the county’s largest building-related company in 1920. Free. Monday-Friday, 9 a.m.-5 p.m., Saturday, 10 a.m.-4 p.m.
View of the Everglades Club on Lake Worth – Palm Beach, Florida. ca 1920. Black & white photonegative. State Archives of Florida, Florida Memory. Accessed 15 Jan. 2019.<https://www.floridamemory.com/items/show/145882>.